Requires interchangeable bezels (sold separately): White 36020 , matt white 35408 , polished chrome 16536 , satin nickel 51800 . This luminaire contains a built-in non replaceable LED lamp energy class A.
EnFiniti™ edge-to-edge multifaceted polycarbonate lens creates low glare and halogen-like appearance. BS EN 1365-2:2000, BS EN ISO 140-3:1995 & BS EN ISO 140-6:1998, BS EN 13141-1:2004. 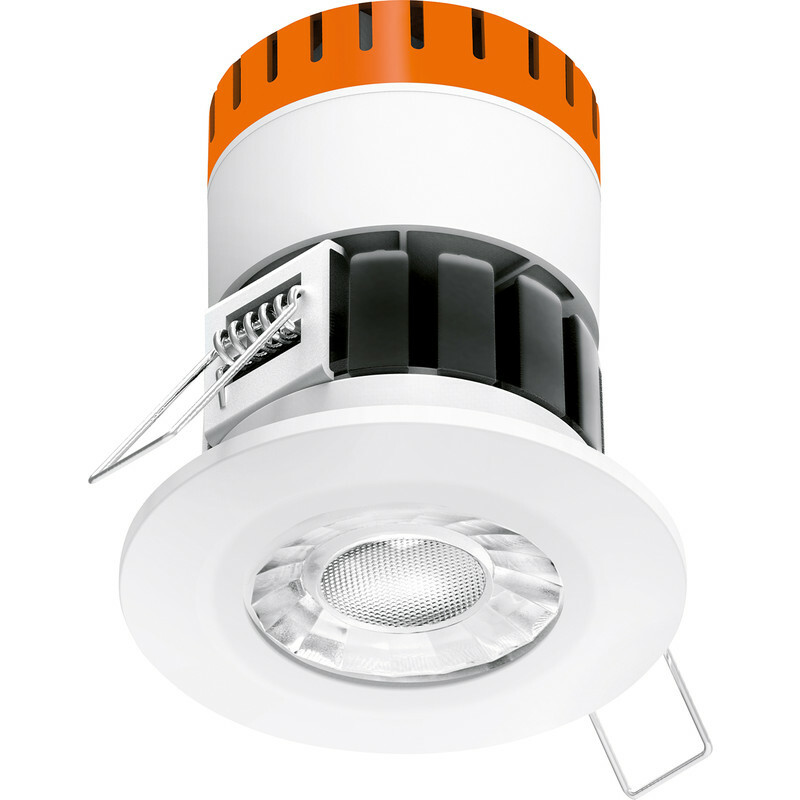 Enlite E8 Fixed 8W Fire Rated IP65 Dimmable LED Downlight 565lm Warm White is rated 4.8 out of 5 by 6. Rated 5 out of 5 by Hemster from Super bright Excellent replacement for my 15yr old LV halogens. Really bright. Don't like the push fit wiring clips but eventually got the hang of them. Am an amateur sparky. Rated 5 out of 5 by Stevie_G from Excellent downlights I have put four of these in my bathroom to replace GU10 downlights. I have added a Varilight dimmer and they work brilliantly. No flicker on dimming to lowest level. Easy to install. The push fit electrical connections aree a little different but not tricky once you get used to them. They may be a bit more pricy than other options but worth the extra. Good quality. The chrome bezels are also really sturdy. Rated 5 out of 5 by Acefixer from Very nice lights Have just installed 4 of these in a bedroom with a dimmer. They are very nice lights indeed and very easy to wire up with their push-in connectors. Brilliant. Rated 4 out of 5 by Brian166 from Great lights I bought these as although they were a little more expensive than other similar led inset spotlights, they were being installed into a flat roofed extension that had insulation above and it was not possible to fit a cover so the feature that these could be insulated over was important. They work great and can be dimmed which I have found not all LEDs work well being dimmed even if it says that they can be. The push fitting for the wires is quite fiddly though and on balance I would have preferred a screw type fitting, but overall very pleased. The detachable bezel is a useful feature for decorating also. Rated 5 out of 5 by Smiffy117 from Very good fitting Awesome fitting. Very easy to install and give excellent spread for bathrooms. Will always buy these.